These free workplace safety tips are a simple, easy, and extremely effective way to keep yourself and other staff members safe during the course of the day. Like all great safety tips, they are easy to implement and very simple to remember. The most recent statistics by OSHA report that 4690 workers were killed on the job in 2010 alone. 18% of those deaths occurred in the construction trades, with OSHA predicting that 437 of the 774 deaths in construction that year could have been prevented by keeping workplace safety tips in mind on the job. No matter what industry you work in, applying safety tips can prevent accidents. If you are approaching a box and don't know what's in it, try moving it a little with your foot first to see how easily it moves. This will help you gauge how heavy the box is. Always wear nonskid shoes when you are lifting often or lifting potentially heavy objects. Have a fire plan in place for your worksite, and make sure your employees understand it fully. Having a fire drill every now and then is a good way for employees to keep escape routes, meeting spots, and procedures in mind. Avoid the use of so-called "power strips" whenever possible. They are often prone to overuse and can start a fire if too many appliances are plugged into them. Keep cleaning chemicals and other work chemicals in a well-ventilated room. Many chemicals emit vapors that are highly flammable and which can be set off with something as small as a spark from a faulty wire. 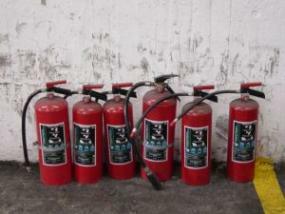 Know where all the fire extinguishers are throughout your worksite and know how to use them. Falls, lifting injuries, and fires are dangerous and common in the workplace, but that's just the beginning. There are many possible safety issues that can occur at your office or factory. Sometimes the best workplace safety arises out of simple good planning and smart thinking. Every single workplace should have a safety committee and safety plan in place. If you don't have safety committees at your workplace, then propose one. If you work at home, you are the safety committee. Working at home or for a very small business isn't a reason to get out of safety planning. Make sure that everyone else in your workplace is aware of the problem. Follow up. Telling someone there's a problem is not a guarantee that the problem will be resolved satisfactorily. Report it and later follow up to make sure the problem was addressed. The OSHA tips focus primarily on work safety tips. However, there are several other important workplace safety tips that can protect you from illegal activity by either coworkers or criminals in your job's neighborhood. The National Crime Prevention Council has a number of great tips that can help keep you safe from crime on the job.